If you’re like me then you want to see your beer when you walk pass the fridge. You want to know how much beer you still have in it so you know you are alright for the big game coming up. I hate a fridge that has a regular foam-lined door because I can’t see what’s inside and it drives me crazy to have to open the fridge each time to see what’s in there! 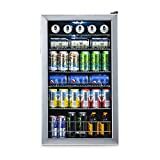 This is precisely why I got myself a Danby DBC120BLS Beverage Center in Stainless Steel – now I’m a happy camper! And being able to see how many beers I have on stock at any time keeps me from running out of beer. And the only thing worse than warm beer, is cold beer, am I right? 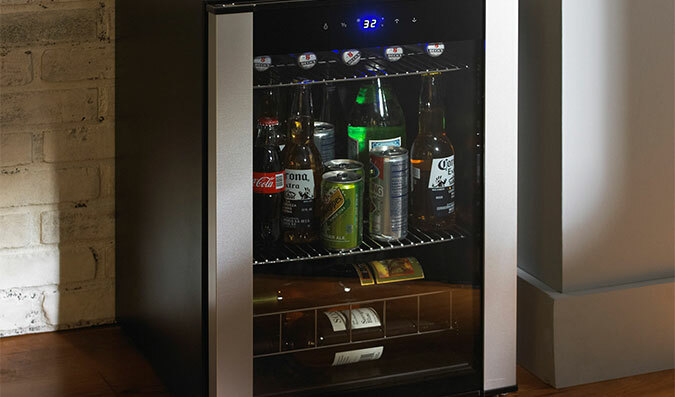 After looking at the Danby, you might be wondering – Is this the best mini beer fridge with glass door out there? Well, let’s see, shall we? I’ve compared different models to see what each has to offer so we can find the best one. The models I choose are among the popular beer refrigerators so we know people like them. Danby can hold 120 cans of beer or coke or whatever you like! This is great if you want to organize a party or you just want to stock up on a lot of beer like I do ;)! NewAir has a capacity of 126 cans! 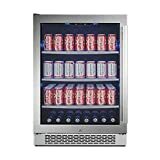 This is the best capacity from the 4 models used in this comparison and definite must-have for the serious man cave. NewAir: 19 x 18.2 x 33.1 inches; 62.8 pounds – it’s interesting that this is larger and yet it is 6 pounds less. Danby: the temperature ranges from 43F to 57F – not the best, but it’s pretty good for me considering how much I paid for this baby. NewAir: can cool down to 34 degrees and has manual controls with 7 temperature settings – pretty cool! NewAir is again the best. Danby: the 43 degree minimum is not the greatest but it does have removable shelves which provide flexible storage layouts. Some people said it died on them after 6 months but it does have a 1 year warranty. I like this model because it’s cheap (affordable) and it is good enough for what I require. NewAir: noise wise it’s okay, shelves can be adjusted, it has the best range of temperatures, hard to find a repairman for outside of warranty problems. 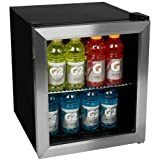 EdgeStar: does not get beverages cold enough but there is a video on EdgeStar’s website that shows you how to move the sensor away from its spot so that the min fridge actually starts cooling everything in it. They should have done this themselves but it’s nice that they are helping with this nonetheless. SPT: wire shelves get a little tippy when you stack many beers. Other that this, it cools great but is expensive. 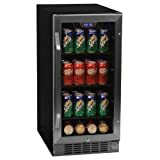 While I like my Danby, it’s obvious from the specs it has and from what people are saying about it that the NewAir AB-1200 126-Can Beverage Cooler is the best choice for the money! It keeps every single beer cold as ice no matter where it’s located, looks great, is silent and is not that expensive (just not as cheap as the Danby).